Unfortunately, running is really hard on my body and I’ve had my share of injuries over the last 20 years that I’ve been running. Shin splints, calf cramps, chronic fatigue and sprains have all been issues for me in the past. I rely on stretching, foam rollers and excellent warm up techniques to help minimize these problems, but they don’t fix them entirely. It wasn’t until I started relying on compression socks and compression sleeves that my pain decreased and I suffered less injuries. The compression helps blood flow and it cuts down on the negative side-effects of running. I have a whole drawer full of compression sleeves today (I prefer them to socks because they are cooler) and I use them for every single run that I go on. I love the sleeves, but I went through many low-quality sleeves while building up my collection. 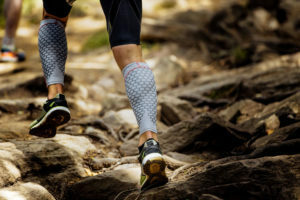 If you’re interested in finding relief from shin splints or other running-related issues, consider compression sleeves, they work pretty darned well for me.